How does a system Turn Chaotic? Up until now we have been describing the properties of chaos. LosiSquare root button, type a number and keep pressing squareroot. You are iterating a map which is the square root function. Rule that takes a number to another number. Iterated maps are repetitive processes where you feed an output back into the map/function as an input. Two other iterated maps, one with a rounded top. Other is a straight line. Iterated maps one of the two main types of dynamics along with differential equations. Iterated maps provide simplest model from transitioning from order to chaos. Parents never live same time as the kids. Bent hump shaped nonlinear relationship. If the population small, then lots of food for next year. If population too big, than hard to find mates. Try to forecast far into the future. Bank account - No bifurcations. You money does not start to oscillate of go chaotic. Bifurcation - A dynamical system branching off into a new type of behavior. Differently qualitatively. Growth rate is a parameter. Break, turning up heat on a stove. Varying parameters can show bifurcations. Than > 3.5 repeats every 4 years (period 4) 4 highs and lows. Thank period 8, period 16, etc.... Bifurcations happen faster and faster. Nonlinearity makes it impossible to find explicit formulas for the maps long term behavior like we could do in the linear case. Linear system - very simple ---> whole exactly equal to the parts. Break problems into parts , add them back and get the same answer. Principle and interest (you can multiply the whole or the parts and add back together). Compete, like insects (for food and mates). Nonlinearity leads to bifurcations and chaos. Chaos was christened in 1975 by mathematicians Tien-Yien Li and James Yorke. Fluid Mechanics, laminar flow vs turbulent flow. Simple nonlinear systems do not possess simple properties. By changing the variable r, we can get the insect population... r like the damping or friction. Any exponential less than 1 goes to zero. transition, damped oscillatory rate but settles in equilibrium. 3) Oscillate in boom and bust cycles... every two years, 2,4,8 and double all the way up to infinity. 4) Chaos where it bounces around erratically. Non repeating, all over the place. All this by simply tuning a single knob. Intrinsic growth rate of insect. Numbers between zero and one represent the carrying capacity or percent of capacity a population will consume. First part that is orderly is the fig tree. Period doublings happening faster and faster. As we increase the growth rate we see the trunk splitting into a two year cycle of high and low. Period doubling cascade, 2,4,8,16,32 and doubling faster and faster. Looks self similar which is a class of objects called fractals. 3.57 there is a wall , impenetrable wall... Called the accumulation point. Infinitely bifurcating tree that converges to an accumulation point, Robert May bewildered. What happens beyond accumulation point. Bob May trained as a physicist and went into biology. One of the worlds great theoretical biologists. Science advisor to the Queen. Explosion of dots at accumulation point. Black stripes interrupt the chaos. Long term behavior chaotic, unpredictable. First black stripe - period three window. Whole orbit diagram is there at the end of the window. Next stripe is a period 5 doubling. What does this orbit diagram mean?? You can predict all the periodicities at any growth rate, where chaos will set in ,everything! If occurs in differential equations then it occurs in nature because differential equations are the correct physical description of Nature. What happens in the logistic map happens universally in a very wide class of systems. The logistic map features such universal features on route to chaos that we expect they must occur in Nature. Burst of yellow/dots is chaos which are interrupted by periodic windows. The windows are the places where the system appears periodically, repeating. Biggest window is the very wide period 3. Cycles that repeat every 3 years or 3 steps. U-sequence is what are the periods corresponding to windows. Or rounded top logistic map. Parabola is what we are looking at which we have been calling the logistic map. Sine Map is ALSO similar but not identical looking. Only the general shape of the curve matters. Why Two? Because two parameters, a grow rate and the population or state space variable. 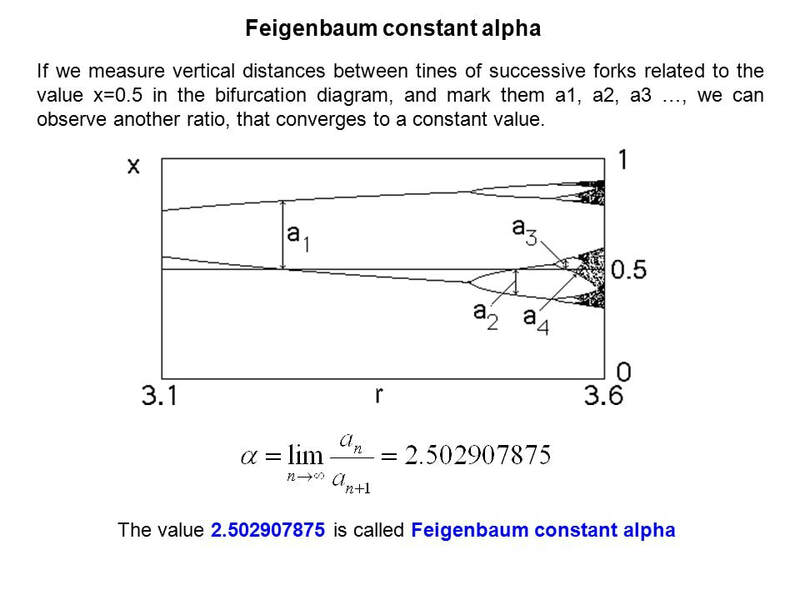 the graphical representation of the “bifurcation tree“, that have 4.669 length between each new bifurcation. Could not get papers published. Used Renormalization Group to explain the numbers. Physics of phase transition. Take a picture and blow it up and rescale it. That is renormalizing. Nobel prize winning work on phase transitions now being applied to the onset of chaos and transitions to chaos. Common thread was both cases looked self similar RIGHT at the transition point whether it be a phase transition or Chaos. They must occur in nature. He confirmed the numbers came out of differential equations, and since differential equations describe nature they should be there. Period doubling and are wishbones shrinking at the same rate. System has to an underlying logistic map that leads to period doubling and leads to chaos. Has an accumulation point followed by chaos. Not all systems have this. Shocking... Logistic map has no scientific content, no laws of nature, PURE numerology. Its like saying I can do something in quantum mechanics by pressing the square root button on my calculator. Old pythagorean dream came true, earth not made of the elements, but rather it is made of number. Cross Disciplinarity -- He applied a nobel prize winning idea from condensed matter physics, to a math problem that a child could play with on a calculator that came from population biology that could explain the ROUTE to chaos in things as diverse as heart cells, electronic circuits, fluids with convection and chemical reactions going to chaos. Borderland between order and chaos... Limited Domain... Doesn't apply to everything. Small number of variables ... Otherwise state space becomes too abstract (100 variables = 100 dimensions. Oscillating reaction between yellow and blue... Chemical oscillations. Reactions can oscillate on route to equilibrium. Growth Rate, Tighten break on waterwheel, dampening in oscillator. There is an iterated map... Lorenz had a witches hat. And a strange attractor (one wing of lorenz). Variable flow parameter is the flow. They saw period doubling in the chemical experiment. Chaos interrupted by periodic windows. 6,5,3... Great confirmation of the theory. Electronic circuits showing oscillations that became chaotic. 4.669 - Shrinkage factor as we apporach chaos. Universal Number also appeared as did periodic windows. Hard to measure more than 4 or 5 period doublings. Control must be taken to control other instabilities. Starts to vary in space ... Chemical... mixed to avoid spacial patterns. Mercury in convection rolls. If you drive system harder and harder, you get instabilities and you get turbulence. Liquid mercury used because responsive to a magnetic. Suppressed instabilities. Feigenbaum cannot handle turbulence. Delicate state (like quantum coherence). Complex systems - billions of interconnected variables - complex space and time, laws unknown. That kind of overreaching provides a backlash. Hardest problem in classical physics. Chaos revolution launched science in a new journey it needed to take... Into the world around us, the world of non-linearity and complexity.